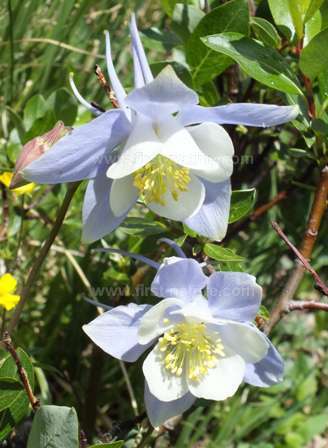 Sometimes described simply as Blue Columbine but also known as Rocky Mountain Columbine, this lovely wildflower is actually Colorado's state flower. It is predominantly a Rocky Mountains species and also grows in Idaho, Montana and south into New Mexico. The best time to see this flower in bloom is from mid-June to mid July. The plant is quite bushy and scrambles over rocks in ravines and on roadsides up to quite high elevations - around 10,000 feet.It also grows in open woodlands where it scrambles over other shrubs and fallen trees. The Native American Indians used the seeds of the plant to make a perfume, first crushing them, then making them into a paste which was spread among clothes to keep them fresh. Aqulegia coerulea (Aquilegia caerulea is a synonym) is a protected plant and so the flowers should never be picked, or the plants dug up and removed. It is easy to cultivate from seed for use in gardens and seeds can be purchased from reputable garden centres.